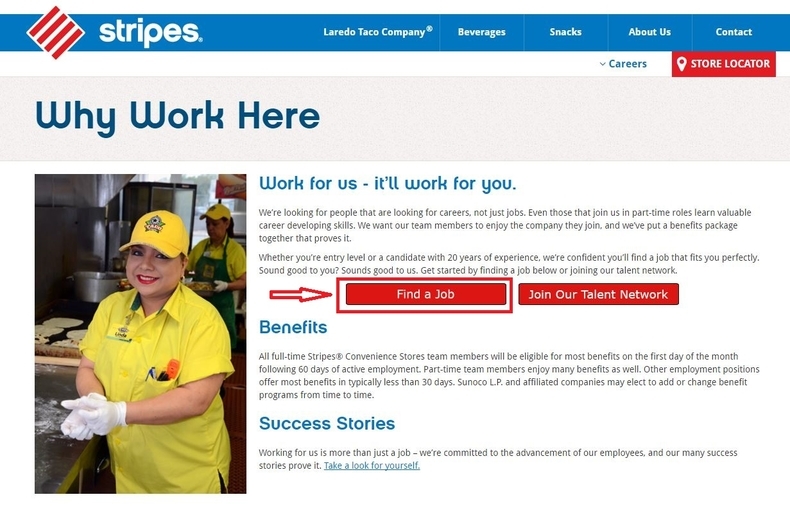 Visit the Stripes careers page at stripesstores.com/careers to enter Stripes Careers official site and you will see a red button "Find a Job" in the middle of the homepage. 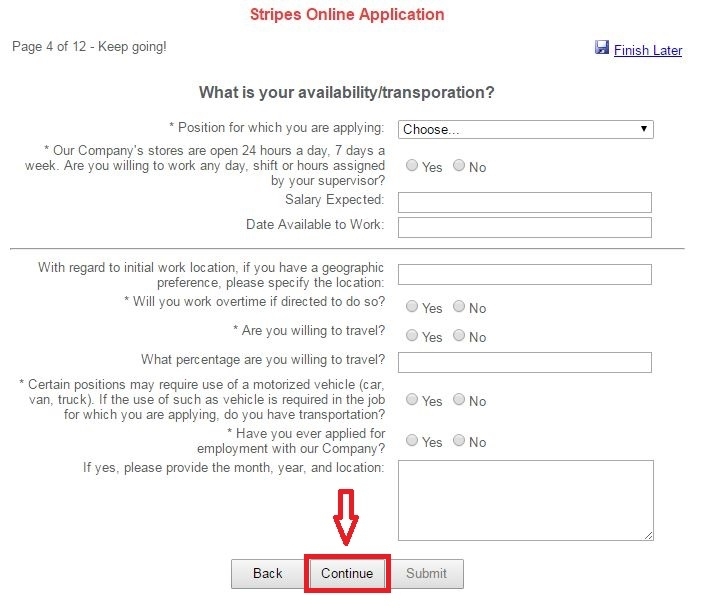 Click this button to view job openings provided by Stripes at present. 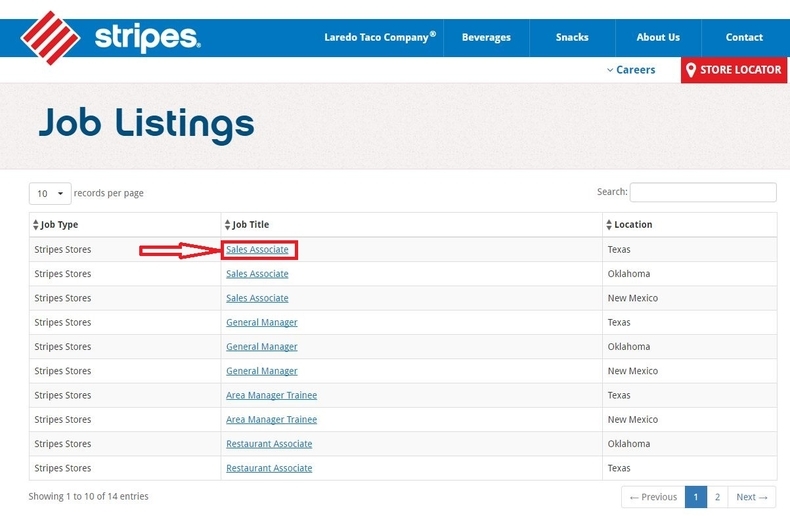 You will be given a search results page in this step, on which you can see all the job openings. Choose a position in accordance with your interests and qualifications to go to the third step by simply clicking the job title. 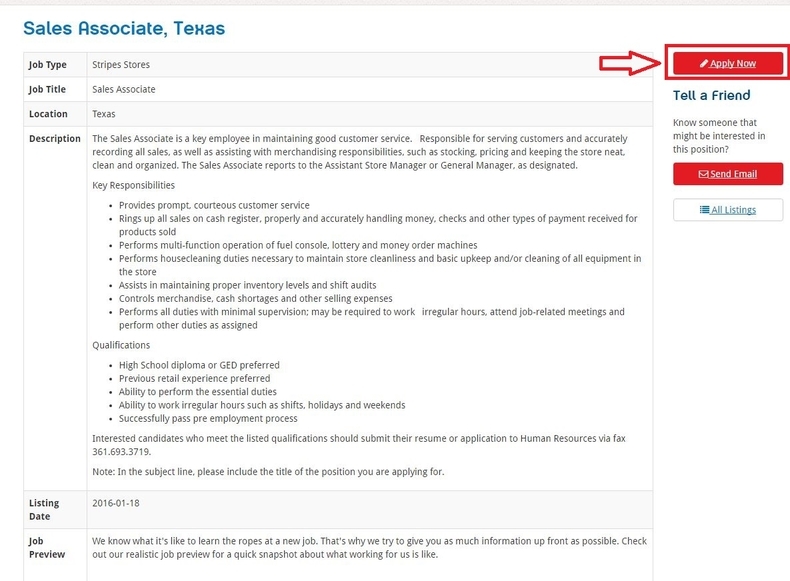 After choosing the position, a job description page will show up. Browse this page carefully to see if you are qualified to take this position. If you make up your mind to apply for it, please click the button "APPLY NOW" to continue. 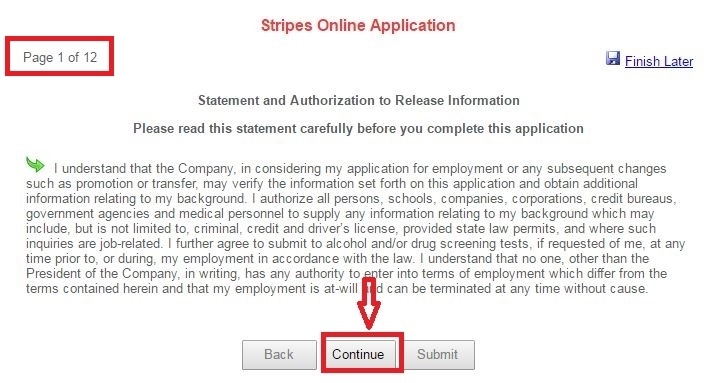 To further your online application, you have to create a new user account in this step. 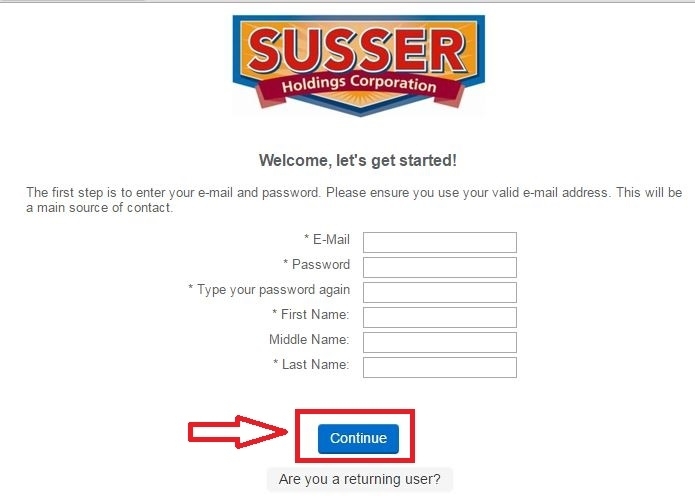 Enter your email address, password and name in the required fields and click "Continue" to get your user account built. But if you have registered before, you may go on by clicking "Are you a returning user?". 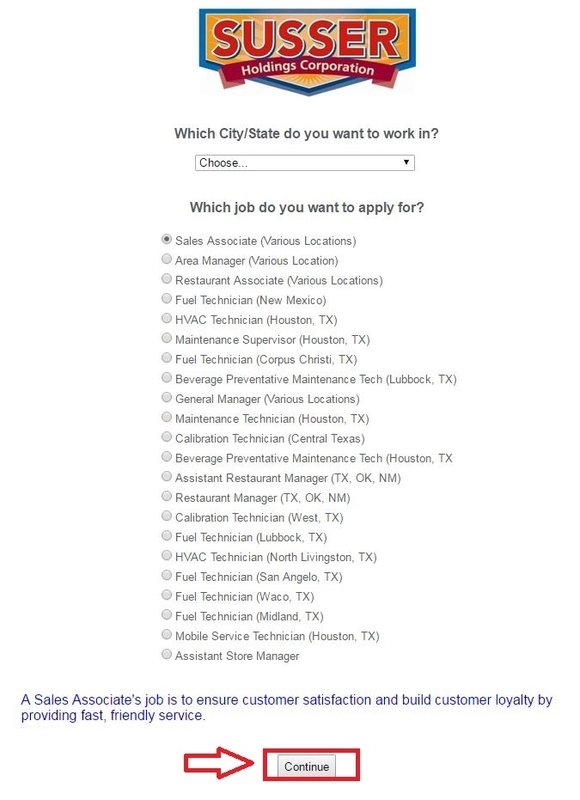 You need to choose the city and state that you want to work in and select the position that you would like to apply for in this step. After that, click "Continue" to go forward. As you can see from the picture below, there are 12 pages in total to be completed to finish the whole application process. The first page is very simple as you just need to read the statement carefully and then click "Continue" to go to the next step. 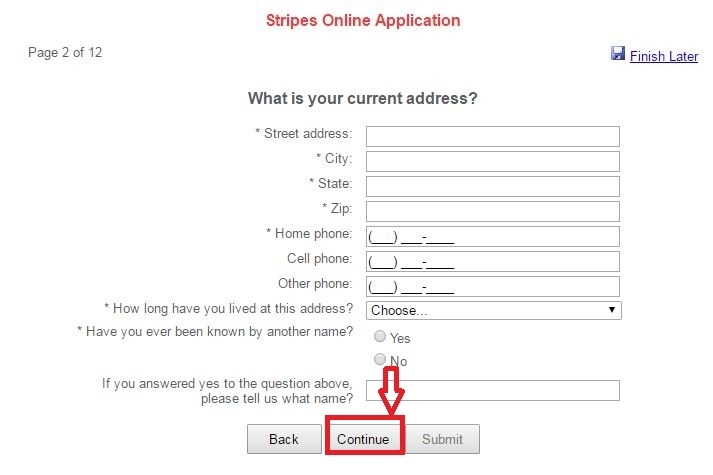 You are asked to provide your current address details in this step. All the mandatory fields are marked with an asterisk. After filling out, you can go further by clicking the button "Continue". 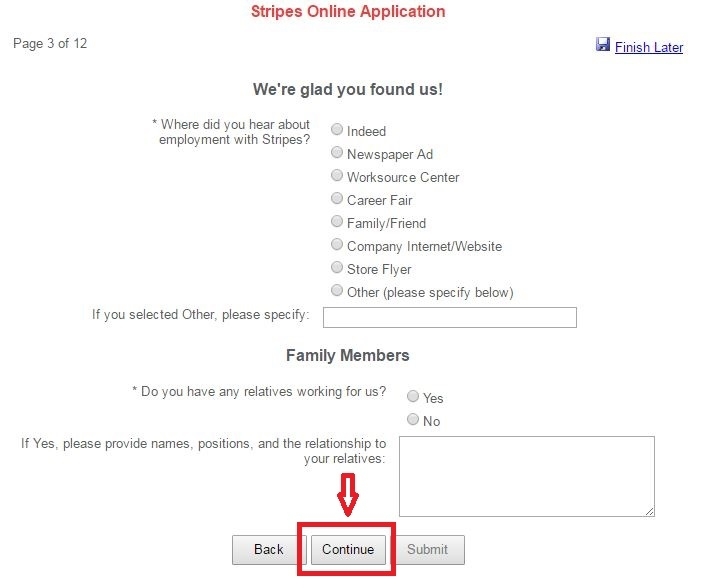 You need to answer such questions as "Where did you hear about employment with Stripes?" and "Do you have a relative working for us?". Provide your answers according to your own situations and click "Continue" to move on. You then need to complete the rest steps one by one. Here steps include availability and transportation, pre-qualifications, employment history, education background, application policies, and skills and abilities. Once you finish each step, you can go on by clicking the button "Continue". When you finish all the nine steps above, you've made your online application almost done. Click the button "Submit" and you will go to a THANK YOU page which means that you've finished your online application process. 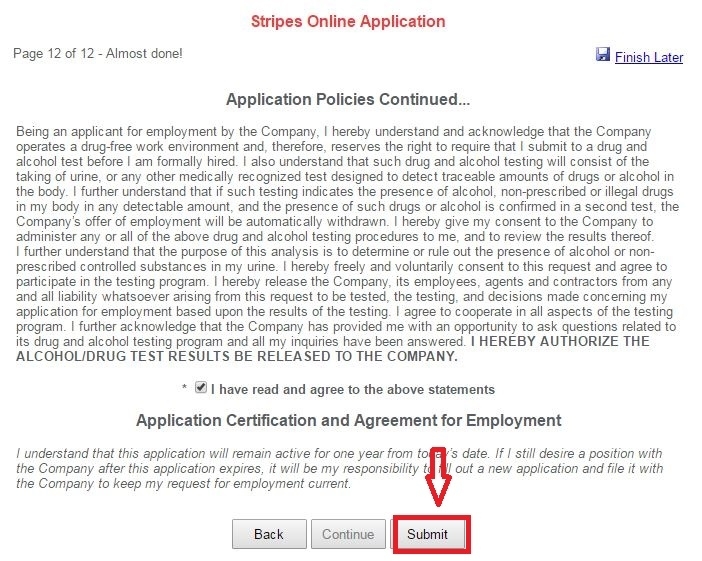 Click stripesstores.com/careers to apply for Stripes jobs online.